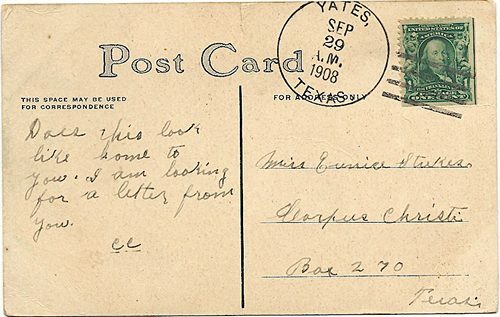 Yates, Texas ghost town history, postmarks, vintage map. Also known as Yates Crossing, this former town began as a crossing for cattle herds on the Llano River. Joseph A. Yates applied for a post office which was granted in 1907. The ford was simply called the Beef Trail Crossing. Huge herds of cattle made the crossing from the late 1860s through the 1880s. 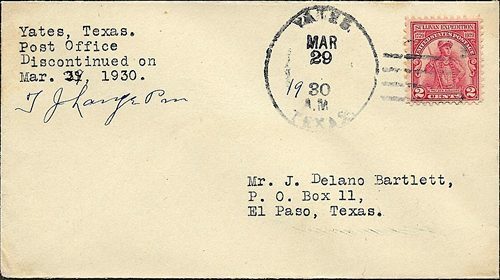 After Yates, a man named Tully Lange became postmaster. It was Lange who oversaw the closing of the post office in 1930. 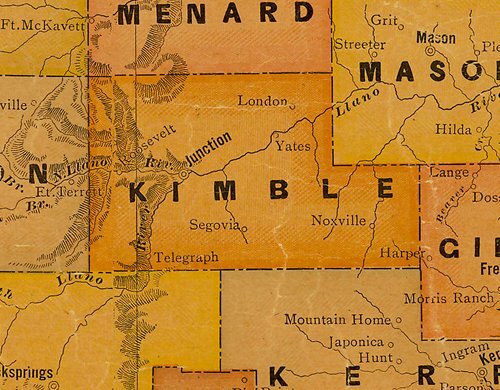 The population of Yates peaked with 51 residents in the 1930s. The town's anchor was a store and gas station. Ten people were counted in the late 1950s, the last time anyone bothered to do so.